Alfa Romeo Giulia Quadrifoglio Interior, Sat Nav, Dashboard | What Car? 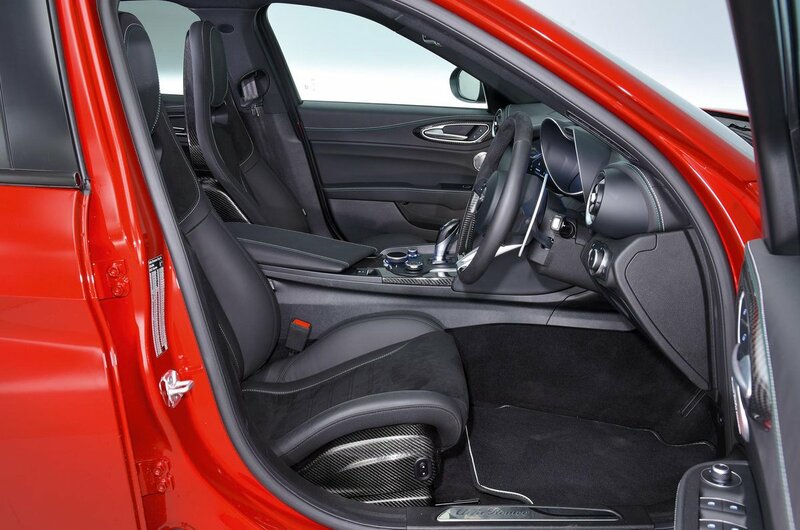 The Giulia Quadrifoglio’s standard driver’s seat is set low in front of well-positioned pedals and allows you to adopt a hunkered-down position. The broadly adjustable steering wheel, with its pleasingly slim rim, complements this. For a hefty premium, Alfa Romeo will fit carbonfibre sports seats. These are brilliantly supportive and worth the extra if you can find it. There’s quite a marked difference in material richness between entry-level Giulias and the higher-end Quadrifoglio. The latter gets a leather-wrapped dashboard and carbonfibre trims that helps the car to bear comparison with the likes of the Audi RS5 and Mercedes-AMG C63. The aluminium gear selection paddles feel superb, too, as does the optional leather, Alcantara and carbonfibre finish to its steering wheel. 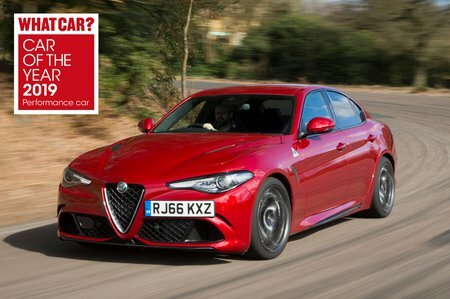 Unfortunately, while it looks good at a glance, the Giulia Quadrifoglio doesn’t match the quality of its rivals on closer inspection. There are too many Christmas-cracker plastics and flimsy switches and buttons dotted around – which simply don’t belong in a car that costs this much. The infotainment system is controlled by a rotary controller and relayed through an 8.8in colour display that appears as if from nowhere behind a smoked screen. There's built in sat-nav and Apple CarPlay/Android Auto smartphone mirroring, but mediocre graphics, a slightly dim display and muddled, confusing menu functionality sadly let it down.